The Sierra Madre Tattler! 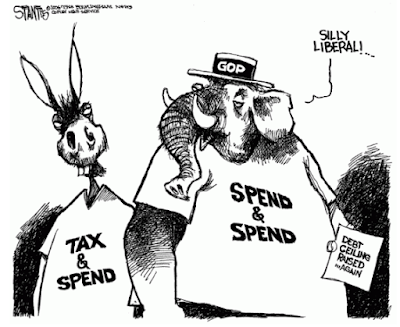 : Trillion Dollar Deficits: The Pasadena Star News Comments on "Tax Cut and Spend Republicans"
Trillion Dollar Deficits: The Pasadena Star News Comments on "Tax Cut and Spend Republicans"
Mod: Thought provoking editorial published yesterday in the Pasadena Star News. Apparently those endless claims made by the GOP about its fiscal responsibility was fake news. With trillion dollar deficits, Republican leaders have abandoned fiscal responsibility (Pasadena Star News link): Trillion-dollar deficits are projected to start next year, according to the White House’s Office of Management and Budget, a reflection of how irresponsible the federal government continues to be. Just weeks later, the OMB issued a budget report indicating the budget deficit would rise from $890 billion in 2018 to $1.1 trillion in 2019. Over that same time period, the deficit was projected to rise from 4.4 percent of gross domestic product to 5.1 percent of GDP. 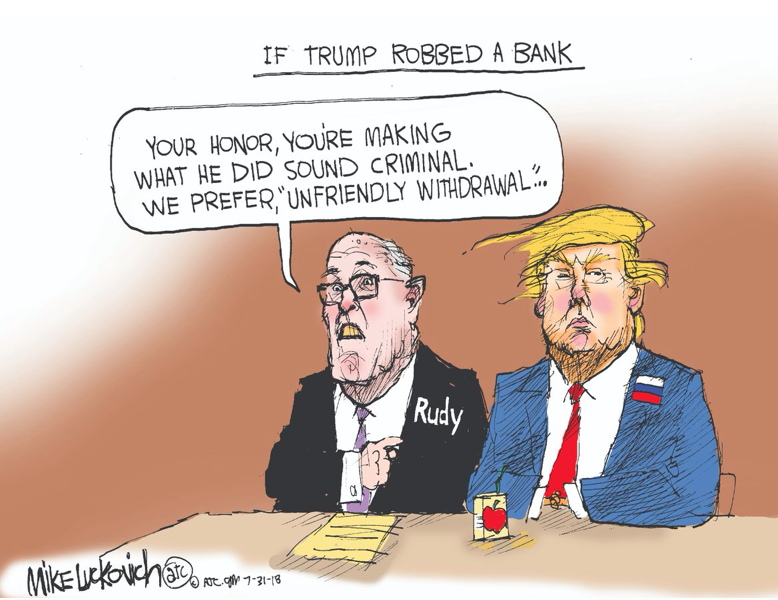 Either way, Kudlow was dead wrong, and the reality is that President Trump and Congress have a serious budget problem to contend with. Notably, the OMB’s figures are even worse than those released by the Congressional Budget Office in April, which didn’t project the federal deficit actually surpassing the $1 trillion mark until 2020. The OMB projects budget deficits over the next decade, with estimates that between 2019 and 2028, $8 trillion in deficits will be run up. Considering the Republican Party presents itself as the party of limited government and fiscal responsibility, it is untenable that a federal government controlled by Republicans is continuing to run up budget deficits. As politically convenient as it might be in the short run to spend without limit, such practices not only threaten the long-term fiscal health of the federal government — they saddle future generations with considerable debt. As seen with numerous spending bills to date, the concern for fiscal responsibility that created the Tea Party has seemingly vanished among congressional leadership. While it is fortunate that tax reform passed last year has apparently helped spur continued economic growth, the notion that the federal government can cut taxes and spend more just doesn’t work. Tinkering with reforms to things like food stamps might have their merit, but that won’t be enough to bring the federal budget anywhere close to balance. This is particularly true given the Trump administration’s fondness for bloating the military budget much faster than it’s willing to cut non-military spending. Unfortunately, tax-cut-and-spend Republicans have become the norm and fiscal responsibility has been tossed aside out of political convenience. If the public can’t rely on Republicans to actually be fiscally responsible, what’s the point of electing them? Millions of Americans Denied Groceries After Failing to Provide I.D. (The Borowitz Report link): Millions of Americans were foiled in their attempts to purchase groceries on Wednesday after failing to provide the proper government-issued I.D. cards. Raising the deficit is one of the many ways war is being waged on America. Trump is trust fund trash running wild with America's credit card. Lets study how a country ruled by a Magellanic to solve it's worst deficit in history, tax breaks and shelters are given to the ultra rich, tariffs are raised against all countries who do business with American Companies and spend like crazy on this Magellanic's wild spending sprees and recover loans to American Company's who are in default? Get ready for another stock market crash. It's just great. The GOP are acting and behaving like the DEMs and the DEMs have taken on the actions and behavior of the GOP! This will make for an interesting upcoming election in 2020. The oxymoron here is amazing. Not once do I ever remember the Mod or the mainstream media running an article on B.O. 's unprecedented spending that ultimately left $9+ trillion in additional national debt, superceding all previous Presidential spending COMBINED. I too, am disappointed with the lack of fiscal responsibility by ALL members of Congress as of late. It's as if they're down and out addicts addicted to spending. Even Trump said we're like Greece at $23 trillion, which we're not far off from hitting, but make no mistake about the previous administration's historically record breaking debt accumulation that the media conveniently failed to spotlight. At least with this administration we might get a tangible asset, the wall, out of it, rather than a massive expansion of welfare benefits. Again, the president doesn’t pass the budget- congress does. Republicans controlled both houses of Congress for the majority of Obama tenure. The reason nobody really talked about it here then is because it was an absolute emergency to stabilize the economy after the Republican-caused economic collapse. The difference is the economy has been restored first under Obama‘s tenure and then during the first year of Trumps’s term, But the Republicans are still in control of Congress and still fail at passing a sound budget. That’s why there’s an article about it now. p.s. $6 trillion of your $9 trillion debt claim would have been saved if the Bush and the extremist right wing hadn’t started to two fake wars in Afghanistan and Iraq. The President has the option of signing or vetoing the budget. Trump is on the hook. Speaking of Tax and Spend, Senator $32 TRILLION "Medicare for All" Bernie Sanders and his wife got some 'splaining to do! Doesn’t sound like much against Bernie, but hopefully the investigation will reveal what actually happened. Medicare for all sounds great! We can easily afford it once the corrupt excess military spending in reigned in... the the rest of the civilized world that has a higher standard of living than the US. Sounds like Mrs. Sanders wasn’t so good at her job despite her PhD. This investigation has been ongoing since 2016... let it run its course like Trump’s, and let justice prevail in both. Bernie and Your Dollars Don have a lot in common. Trump spends other people's money like he couldn't care less. Trump's trillion dollar deficit is theft. trump tripled that amount in 2 years. Today the Federal Debt is about $21,313,061,060,202.36. Federal Debt per person is about $65,317. What is the per person debt in sierra madre for bonds and calpers? Too much, is what it is. Terrible council management since 2002, and chickens come home to roost. 7:10, like his Putin puppet pr*sident, leads with a lie. 7:10 knows very well that Obama had to convince Congress to spend our way out of the massive recession caused by W and the GOP that without such spending would have spiraled into a Great Depression. 7:10 knows this and also knows that it has been written about extensively, but he, like his lying pr*sident, prefers to lie. Completely agree with blogger 7:10am, well said. Its gonna take some cash in order to get the long list of "Re-Do's moving in the direction of "getta done". So you agree with lies Comrade. Cutting regulations, MAGA. Replacing all the poorly thought out last administration's decision in an effort to help the American people. Right time for this type of President to lead this country. Politicians have just made a complete mess out of everything. Trump is a politician- that why he personally invited Hillary to his wedding. His campaign manager, who’s currently on trial, has been a lobbyist for decade. He is the same swamp. To build large buildings in Manhattan, you have to be a politician who knows and plays the political game. Like all politicians who lie, Trump completely fooled and continues to fool his base with his “I’m not a politician” schtick. Regan tripled the national debt! 8:19am another "patriot" trying to say that 911 was an inside job. $6 trillion is the projected cost of the two Bush extremist right wing fake wars in Afghanistan and Iraq. P.s. I was in manhattan the day the towers fell. I walked 2 miles south from midtown to help. They wouldn’t let nonresidents south of canal street, but we handed out water to the responders pouring down the west side highway for the next week. When my friend’s apartment just blocks away from the trade center was declared uninhabitale I let them stay in my home rent free for months until they were back on their feet. I don’t need some anonymous goon to tell me what patriotism is. 9:22 is fake news. Have a nice day and keep looking for those weapons of mass destruction. You’re such a hero. Tell us more about your righteous acts. Sounds like Bernies wifey stole the money 8:27am. Who said that besides you? Lol 7:27am Who's the We, in that "we" can afford it? You gonna kick in all your bankroll and work daily for freein order to keep Medicare fir all? Now, what are the names of those countries where Socialism and Medicare work for all? Trump Trillion Dollar Debt. Failure. Venezuela has 1,000,000% inflation. Socialism works. Debating you is like shooting fish in a barrel.. too easy. We need higher-quality foreign trolls in this site. So move there, if they’re soooo freaking fantastic. Oh yeah great 8:07am. So great that the GDP remained at 1% during President Obama's 8 years in office. Foo’ fails to take into account the fact that Obama inherited from W & GOP a GDP of -8.2%, so bringing it even to 1% was quite a feat, particularly in light of the fact that Congress was controlled by GOP. Foo’ probably hopes for double-digit growth in GDP. I’ve got some old WIN buttons to sell to foo’. When an Uncle Trumpie says fake news, it is the equivalent of him sticking his fingers in his hairy ears and saying ""Lah! Lah! Lah! I can't beat you!" Another trust fund trash Republican who lost the popular vote. National Ice Cream Sandwich Day. Social Abnormalities is outlined in strategy to combat technical institutions operations and interferance. Malicious cyber software, propaganda and bots. Bloggers on this site, you know who you are, have been flagged as Abnormalities and will be contracted in the future by email and instagram. Take your ID if you want to buy an ice cream sandwich. Had to laugh at what I saw on Facebook, "Obama" saying, I tried to buy groceries at the store, but the only ID I had with me was my birth certificate." lol, like you own a home in Manhattan's upper side! We were there when the attack happened. One of our many business ventures consists of filters for the breathing apparatuses used with air tanks for first responders. Yes this was Terrorism against the United States. If you, 11:49am dont consider this an attack upon the United Ststes using a weapon of mass destruction, then you are a mindless buffoon. Check out the reasons why the United States entered into the conflicts in the Middle East and stop making up Alt "facts". 9-11 was an attack on the United States. So were the Russian cyberattacks that put Putin's buttboy in the White House. 3:57 is straight up foreigner spy/terrorist and/or a war profiteer. Claims he was ‘there’ in NY on 9/11... then claims NY has an ‘upper side’. No one who knows the city says that. I've become convinced that anyone who says "Lol!" Is not from this country. Good points 4:33 and 4:55. Also, English speaking people don’t really use the word ‘apparatuses’. Only fools don’t realize that our entire infrastructure and a great deal of corporate costs are socialized. The only thing completely privatized is profits. The Russians and Chinese bots will cyberpunk the Dems again in 2020. Simple and easily distracted from facts, thinking that #45 was elected by mistake. The weak will be trampled by the citizens headed to the polls to keep America Great. Oh hey, Benedict Arnold has joined the conversation! Trampling the weak - this is your idea of what is good in America?